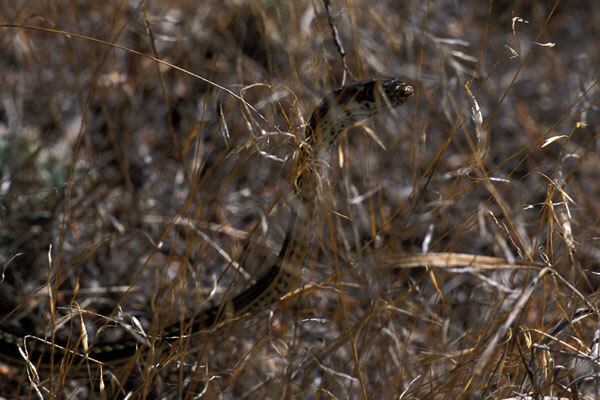 The first two snakes I saw in Big Bend National Park were Coluber taeniatus girardi, but both of them escaped from my camera. The first was a medium-sized individual crossing the road at high speed just south of Persimmon Gap. The second was a very large snake out for a prowl near Rio Grande Village, close to the river. It was motionless when I noticed it, with its head up and resting on a small rock cairn that was marking the trail. I slowly reached for my camera but the snake was too alert for me; it turned on its snakey afterburner and vanished into some vegetation. All whipsnakes are extremely fast. This one seemed confident enough of its ability to race away if necessary that it didn't move too far when we disturbed it. My wife heard this snake rustling, and I turned to see it just as it was about to speed out of sight into some bushes. I snatched it quickly to verify the species (recognizing instantly that it wasn't a rattlesnake, the only venomous snake around), and it repaid me with three bites to the hand. 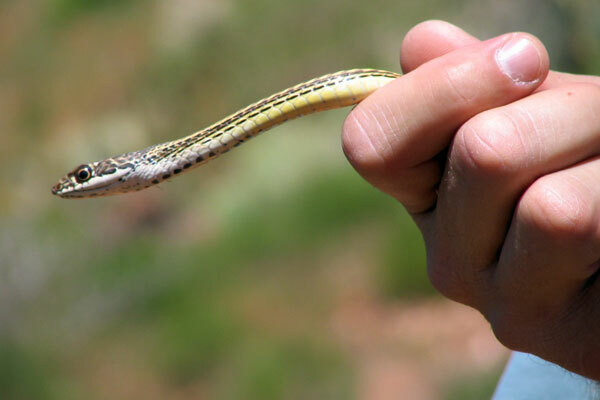 This genus is sometimes affectionately called "Nasty-cophis" for their propensity to bite when cornered or handled. Fortunately for me, its bites did not hurt or break skin. When I released it, it sped a short distance away and then went into the head-high watchful pose seen here. I found this large whipsnake under a rock. I suspect it was just prowling for food under there rather than resting. Knowing that it would shoot off like lightning in a moment, I grabbed it in the hopes of calming it down enough to get a decent photo. It wasn't too happy about this and bit me a few times on the hand. Eventually it stopped squirming enough that I could get the closeup of its head, though I was still holding on a foot or so behind the head. I must have been quite a sight, trying to position and focus my camera on a tripod with one hand while holding onto a fairly large and strong squirmy snake with the other. After the photos, I gently released my grip, and it shot off like lightning. 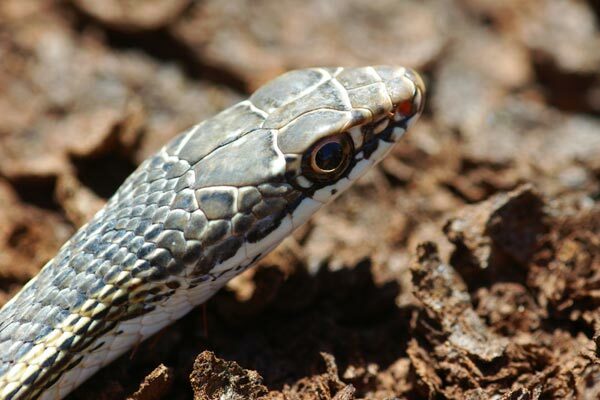 Whipsnakes are among the minority of desert snakes in that they are exclusively diurnal, willing to take on the hot desert sun. 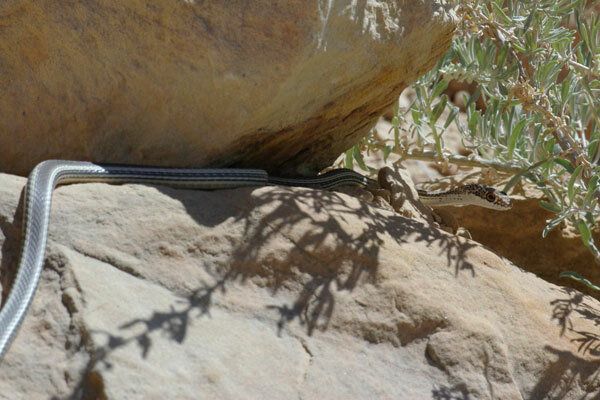 This young snake was lurking about in the late morning, probably looking out for tasty local side-blotched lizards and such. 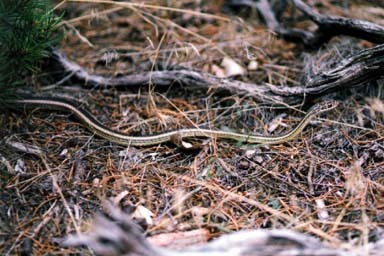 I passed this whipsnake while driving up a dirt road. Just as we went by, my brain registered its snakey shape, and specifically its whipsnakey shape. Knowing how quick to flee your average whipsnake is, I didn't think quickly stopping to get out of the car was a good idea. So I gradually slowed down and stopped, then slowly backed up to the snake's position. Happily, this didn't spook it off, so I rolled down the car window, stopped the engine, and slowly gathered and aimed my camera out said window to get a few photos like this one. Another car soon pulled up behind and the whipsnake disappeared in a flash. 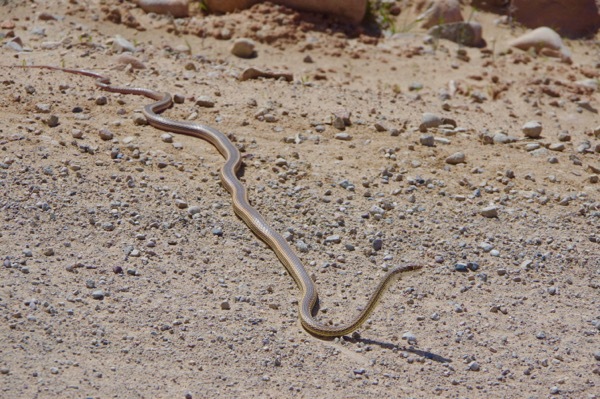 This wide-eyed little whipsnake and I sighted each other at almost exactly the same time. It was exposed on a rocky hillside, and spent a frozen moment deciding whether to dive into a crevice between boulders, or climb into a small exposed bush. 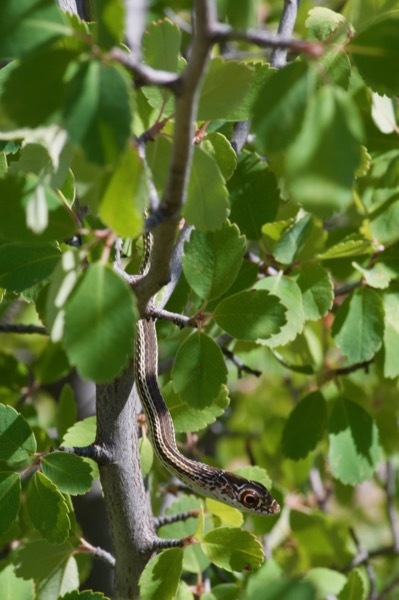 This seemed like sort of a no-brainer to me, but I am no snake; it chose the bush. It seemed pretty confident that I couldn't possibly see it through the leaves. It was wrong.